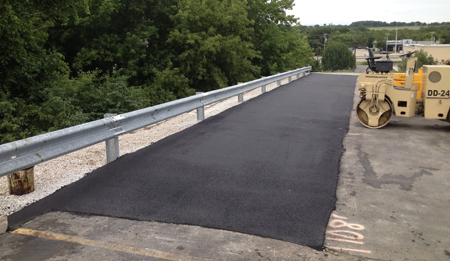 AAA Asphalt LLC of Muskego, WI is a full service asphalt contractor offering a full suite of commercial asphalt repair services – from basic parking lot repairs to complete parking lot excavation, there is no asphalt job too large or too small. AAA Asphalt repair contractors are paving / patching, seal coating and hot crack filling specialists. We guarantee professional workmanship at an affordable rate. We pride ourselves in offering superior quality and completing our asphalt paving jobs on time and on budget – the first time. Plus, we only use quality materials to ensure that our completed work stands the test of time. As durable as asphalt is, nothing in this world lasts forever without a little bit of maintenance and repair. Should you experience dips in your asphalt covered service or should something create a hole in that surface (accidents do happen after all) we’re here to help you return that asphalt paved surface to its original state. Our efficient staff will make sure that the job is done thoroughly, safely and with as little inconvenience to you as possible. Your paving or patching experience with AAA Asphalt LLC will hold no surprises other than possibly how striking the final product looks. The last thing you want to be doing on a nice day is applying seal coating to your asphalt-paved surface. It’s smelly, it’s hot, messy and it’s inconvenient at best. That’s why we’re here to give you a hand. Seal coating will help to bring back your business parking l0t back to new. A great first impression is critical. No matter where you live, chances are that the elements have a hard time making up their mind or staying committed to one type of weather condition. Hot then cold, sunny then rainy, ice, snow, salt… All these things and more contribute to the breakdown of your asphalt paved surface. Dips, holes and cracking will appear and that lustrous sheen you remember from back when that service was newly paved will fade and fade. Though these conditions are bound to rear their ugly heads there’s no reason to put up with them. AAA Asphalt LLC is here to help both you and your asphalt paved surface through the rough spots. AAA Asphalt LLC can fill in those cracks and dips and apply a new coat of sealant in an effort to make your driveway or other asphalt covered surface look like the day it was laid. Although asphalt can be a very tough surface, harsh winter weather and summer baking heat can take a toll. Your parking lot or driveway eventually will crack and even sag enough so that it no longer has a professional look. You will need to have your asphalt repaired, filled, resurfaced. Let us help. Call AAA Asphalt in Musekgo and we will make your asphalt look professional once again. We understand time and the inconvenient of taking on a project. We will work with your schedule to make this convenient and will give you a sense of relief knowing how great your asphal tonce again looks. We proudly provide our asphalt resurfacing services to Muskego, Milwaukee, Franklin, New Berlin, Hales Corners, Greendale, West Allis, Wauwatosa, Greenfield, Oak Creek, Burlington, Tess Corners, Mukwonago, Wind Lake, Big Bend and in so many other Wisconsin communities.